Tonight we had two special guests over for dinner, Andrew’s boss Barry and his wife Chris. Barry and Chris are very health conscious so I put together a healthy plan for two pizzas. 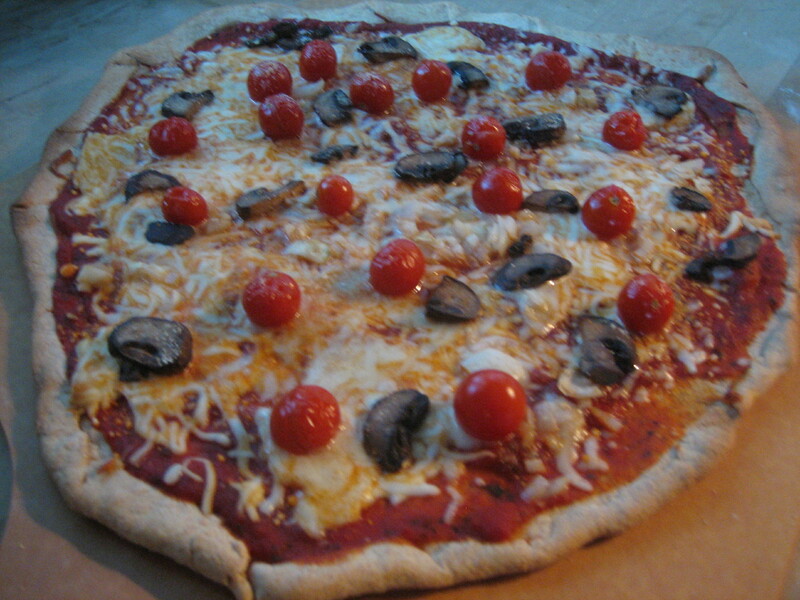 The first being my Mushroom, Tomato and Onion pizza recipe. Typically, I roll my pizza dough very thin but I managed to get the dough super thin on this pizza. I spread on marinara, tossed on low-fat mozzarella cheese, sautéed onions and mushrooms. Then I finished it off with cherry tomatoes from my mom’s garden. The pizza turned out delicious, but check out my pizza #48 to learn about the winning pizza recipe of the night. This entry was posted in cheddar cheese, cheese, mozzarella, mushroom, Onion, Seasonal, Summer Recipe, tomato, vegetarian, veggie and tagged cheese, Mushroom Tomato and Onion Pizza Recipe, pizza recipe. Bookmark the permalink.